Having previously debunked the fisherman’s legend that fish don’t feel pain, the University of Liverpool’s Dr Lynne Sneddon has become a leading figure in the movement to reduce, replace and refine the use of animals in scientific research. Uncomfortable with the increasing use of adult fish in pain research, Dr Sneddon and colleague Dr Javier Lopez-Luna at the Institute of Integrative Biology have led a new study to investigate a potential alternative. 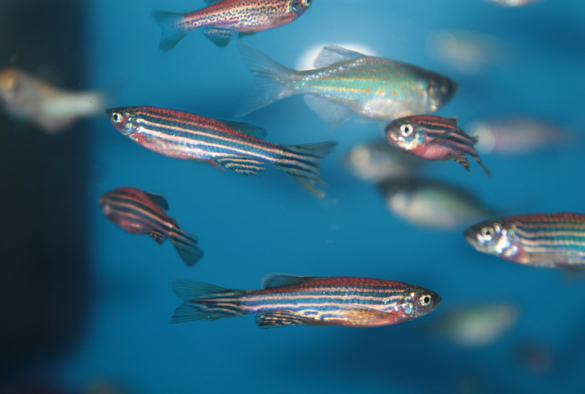 “Previous studies have identified multiple subtypes of pain receptors in zebrafish…even as early as a few days post-fertilization”, the researchers note. Could they replace the adult fish that are used in research with larvae that are a matter of days old? Only if they could prove that the larvae respond to pain and any discomfort could be relieved. The study, which is published in the Journal of Experimental Biology, involved exposing 5-day-post-fertilization zebrafish embryos to dilute concentrations of acetic acid and citric acid, both of which are known to irritate adult fish, and tracking the larvae’s activity with software produced by researchers from the University’s Department of Electrical Engineering and Electronics. Analysing the minute fish’s motion, they noticed that the larvae became less active in the two most dilute concentrations of acetic acid (0.01 and 0.1%). However, the most concentrated acetic acid (0.25%) and all three concentrations of citric acid (0.1, 1 and 5%) stimulated the fish to swim harder and farther, possibly in a bid to escape the uncomfortable sensation. But when the team administered pain relief to the disturbed fish larvae – in the form of aspirin, morphine and lidocaine – their discomfort appeared to be relieved and their behaviour returned to normal. Now, having confirmed that larval fish are capable of experiencing pain and benefit from pain relief, the researchers recommend that larval zebrafish can be used as a model for the study of pain and pain receptors, sparing many of the adult fish that are currently used in toxicity tests. The paper ‘Reduction in activity by noxious chemical stimulation is ameliorated by immersion in analgesic drugs in zebrafish’ is published in the Journal of Experimental Biology [doi: 10.1242/jeb.146969].